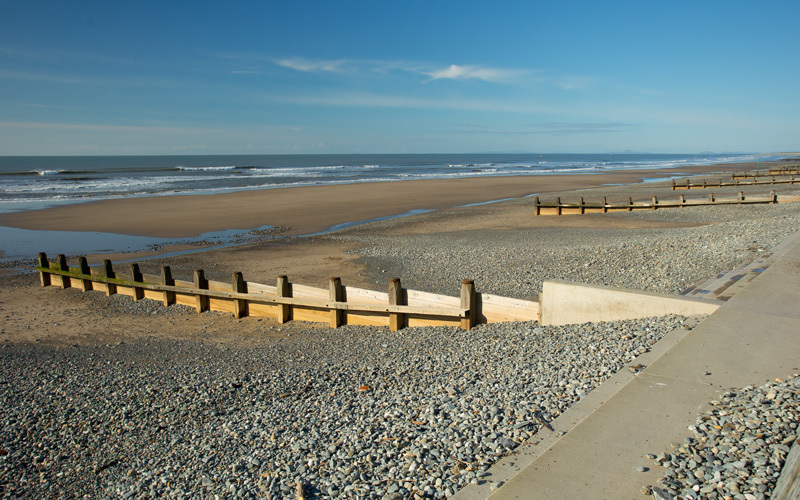 Tywyn coastal frontage has suffered significant storm damage since it was first constructed in the 1930s. Over the last 100 years the width of the beach has decreased and the beach level has dropped by 3m. Erosion of the beach, combined with deterioration of the groynes contributed to the undermining of the sea wall and an increase in flooding. 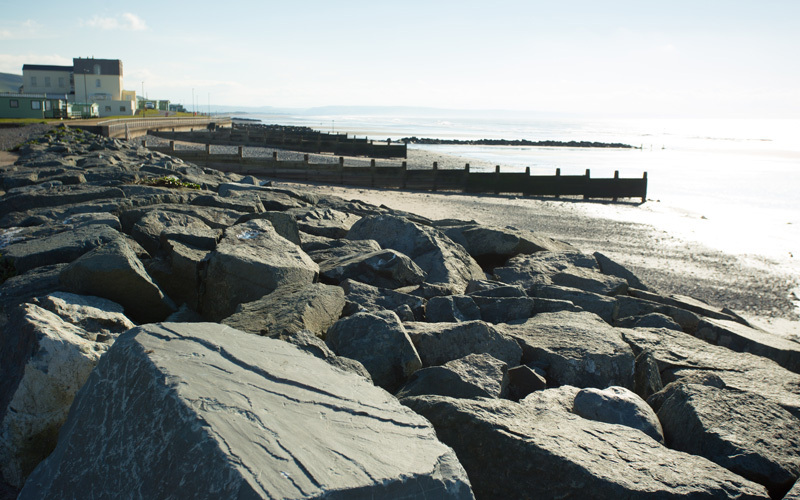 A scheme was developed by Gwynedd Consultancy and Atkins providing an inspirational solution including an offshore breakwater and rock groynes. Refurbishment of the sea wall, restoration of the stepped revetment and new shorter timber groynes were now possible, extending the design life of the flood defence structures and substantially improving access to the beach. Not only was the scheme designed to reduce the risk of flooding for 78 homes and various businesses, but it has transformed the beach from its dilapidated condition to a fully improved amenity with greater access to the beach, which will be a boost to tourism, business prospects and regeneration opportunities. There was an ECI stage where a risk management and value engineering exercise was completed. This allowed the contractor to source the rock required early in order to minimize the risk of delays as a result of bad weather. 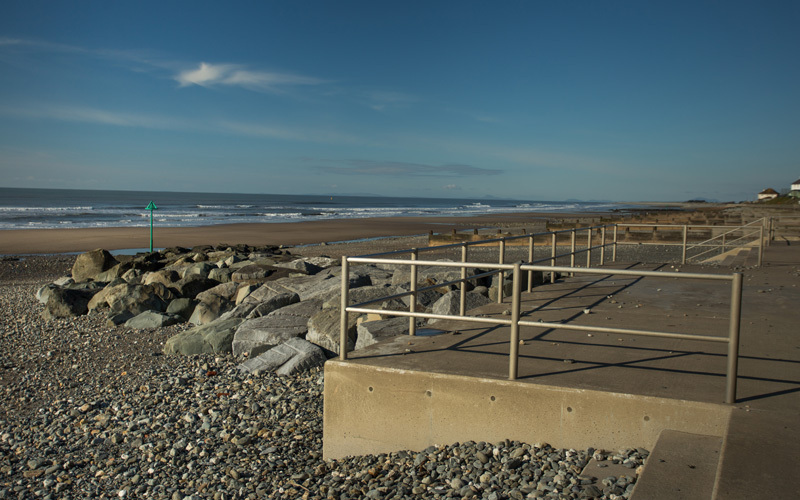 This cost certainty, due to collaboration, enabled Gwynedd Consultancy to release further monies from their risk contingency back into the Scheme for additional work, including a new promenade wall and railing, boat park, extended slipways and disabled ramps, refurbished viewing shelters and sea wall repairs. 30,000 tonnes of rock was delivered by sea from St Malo, France, with a high risk of being delayed by storms since deliveries would be required in January and February. 11,000 tonnes of the rock were delivered by lorries from Penmaenmawr and Minffordd. Also, 9,000 tonnes were hauled by road from Penmaenmawr Quarry to the Port of Penrhyn, and then taken by sea to Tywyn. Recycled timber from Scotland was used for the groynes; improving the schemes carbon footprint, increasing sustainability and giving certainty of programme. Collaborative working and a high focus on sustainability complete with an interaction with the Community and Stakeholders has made this scheme into an Exemplar Project, which was proven with the presentation of the ICE George Gibby Highly Commended Award.